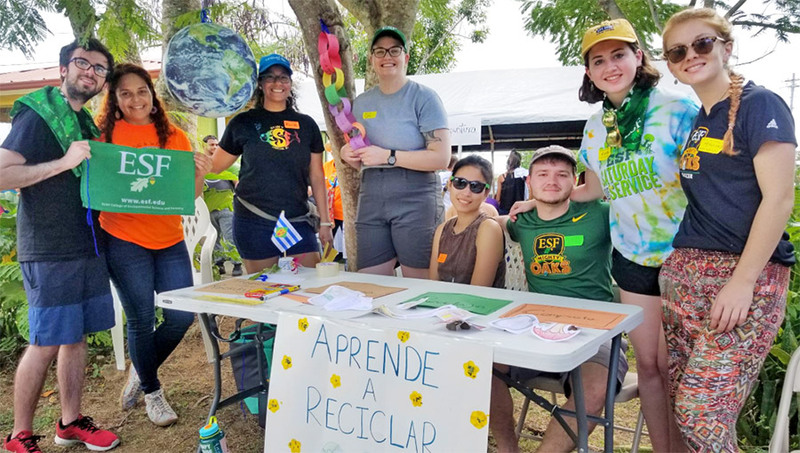 Relief and education projects filled the days of a team ESF students, staff and faculty on a trip to Puerto Rico over winter break. The group traveled to Vieques, an island off the eastern coast of Puerto Rico, to continue relief efforts related to 2017's Hurricane Maria. A number of the students on the trip are members of Acorns to Action, a student-led relief organization. During their weeklong stay the team helped build three short recreational trails, cleared trees that fell because of the storm, cleaned litter from a public park, painted the inside of a school, cleared land for farming, documented a trail system in the national refuge and prepared the Boys & Girls Club for new students. Chief of Staff Mark Lichtenstein, part of the ESF contingent, said the students' presence in Vieques didn't go unnoticed. After clearing land at an organic cooperative, one of the farmers prepared lunch for the group using only ingredients from the farm. The farm might also provide opportunities for soil analysis and citizen science down the road, Lichtenstein said. The ESF group made an impact when they painted the inside of a local school. "The young students there were enamored with our team," Lichtenstein said. "The teacher was in tears when we arrived and when we finished." In another project that benefited the youth of Vieques, ESF joined with another nonprofit to rehab a small training facility for young boxers. "The gym was started by a man who used all his assets to get kids off the streets and into something structured - something that builds self-esteem and self-respect," Lichtenstein said. "The storms damaged his facility, creating a situation where kids who relied on this place of refuge now had nowhere to go." The students documented a trail system in the national refuge operated by the U.S. Fish and Wildlife Service. Even though the refuge is closed due to the federal government shutdown, ESF was given access to the trails. The work included taking GPS readings at various intervals, documenting flora and fauna through pictures, and capturing sounds (the ecosystem's "soundscape" at various locations). "The intent is to develop a multimedia product for these trails, and encourage more local access to the wonders of this place," Lichtenstein said. A team worked at the Boys & Girls Club, getting the facility ready for new students by power washing the walls, chairs, and tables, and assembling educational materials. A public gazebo and railings on El Malecon received a fresh coat of paint. The malecon is a favorite spot for visitors and locals, offering a variety of restaurants and a beautiful view of the Caribbean waters. "We had our ESF banner prominently displayed, as we did at all our locations. Throughout all our projects, people came to learn what we were doing, or to join in," Lichtenstein said. "At the malecon, a local doctor was so appreciative that he purchased pizzas for the entire painting team of ESFers and locals. In all of these projects, we worked hand in hand with local residents." Not all the students' goodwill was structured. One day while waiting for the ride back to basecamp, students noticed a woman struggling to carry her groceries in the rain. They were immediately at her side, offering to carry her bags and holding an umbrella for her. "This one act of random kindness, witnessed by many of the local people epitomizes the sensitivity and caring exhibited by our students during the entire trip, and this behavior and word of our work spread like wildfire in this small community," Lichtenstein said.